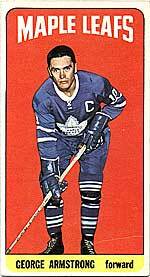 George "Chief" Armstrong, born in Skead, Ontario on July 6 1930, started his NHL career with the Toronto Maple Leafs in 1949. George only played two games in his first season as a Leaf. In 1950, George went to the Pittsburgh Hornets of the AHL for the next two years returning to the Leafs in 1951 as a centre. The "Chief" played with the Maple Leafs for 21 years over his NHL career. During his time as a Maple Leaf, George gathered 1187 games, 296 goals and 417 assists. His playoff seasons earned him 110 games played with 26 goals and 34 assists to boot. Two of George's greatest feats is having his name on the Stanley Cup four times and being Captain of the Maple Leafs for 11 years. The "Chief" as he was known for his native background, retired from the NHL after the 1970-71 season and returned as coach of the Toronto Marlboros of the OHA Junior "A" League. A hockey legend in his time, George was elected to the Hockey Hall of Fame in June of 1975. Not bad for a guy born in the little town of Skead Ontario eh!